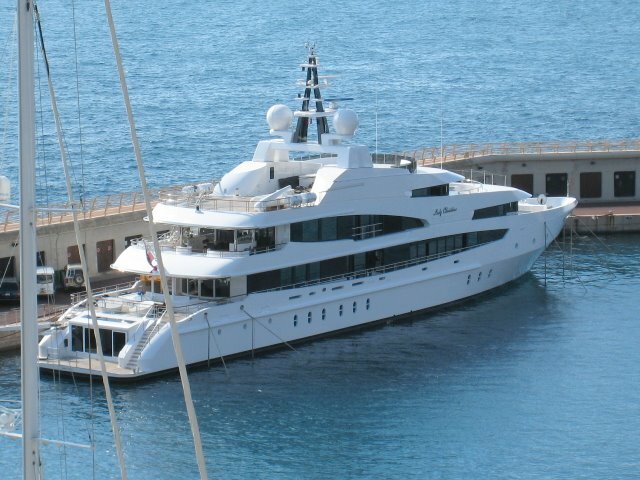 This beautiful yacht is seen in Cap d'Ail harbour. Cap d'Ail borders Monaco and in fact I took this photograph from Monaco - from high up in an apartment in Seaside Plaza in Fontvieille. If you click on this link, you can see Seaside Plaza in the background. The Lady Christina, a 203 foot long super yacht, was first launched in 2005. Since it was launched only in 2005, I don't suppose it is named after Christina Onassis? No, that's the 'Christina O' which is now a charter yacht, I believe. This one is a lovely looking yacht, isn't it? My size too - well our size? yes but when compared with the 'Lady Moura' this thing's nothing but an old trawler!